November 13, 2017 November 13, 2017 Dan O. The higher-ups just need to know what they’re dealing with. Derek Cho (Steven Yeun) is having a pretty crappy day. After being unjustly fired from his job, he discovers that the law firm’s building is under quarantine for a mysterious and dangerous virus, in which people start acting out in violent ways and killing one another, but for some reason, no cause for punishment is to be found. So Derek, who now has the virus, begins to act out too, taking down people who have done him wrong and have pissed him off to the high heavens, with the FBI outside, trying their best to contain the violence to this one firm’s building. And along with co-worker Melanie (Samara Weaving), Derek plans on attacking and taking down the executives, once and for all. Issue is, they’re on the top floor and it’s going to take a whole lot of violence to wade through, just to get to one of them, let alone all of them. Mayhem is a crazy movie, but it’s also actually grounded enough in reality to where it works better than you might expect. Director Joe Lynch seems to take this idea of absolute and total carnage, but rather than just trying to one-up himself, each and every chance he gets, he actually gives us a story, with characters, and a real sense of tension in the air. It’s not just sick, disgusting, and sometimes disturbing violence, for the sake of shock-value, but sick, disgusting and disturbing violence, with a reason and a cause. Which is, yes, to disgust us. But it works. Lynch and co-writer Matias Caruso also do something else smart with Mayhem in that they set all of the carnage and brutality in a world that isn’t too unlike ours. While the mayhem-inducing virus itself, may be a bit silly, the movie uses it as a way to act out all of its craziest, most violent fantasies of taking down the higher-ups within a corporation, who don’t care one bit about the bottom or those below them – instead, they’re just more concerned with more money, more power, and more control, regardless of who they stop on, or kill, when they’re up to the top. In the context of what Mayhem is doing, this is actually taking literally and because of that, the movie feels a lot more honest and realistic than you’d expect. It’s still over-the-top and crazy, but it is, once again, grounded to give it a sense of time and place. 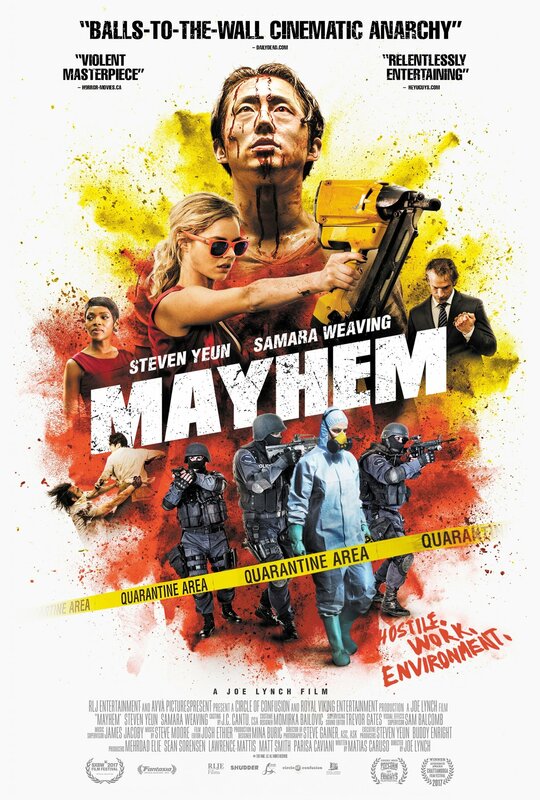 Also, not to mention that the violence is pretty crazy and fun, making Mayhem a nutty movie that has some social-context, but also doesn’t spend too much time preaching, but instead, just chopping all sorts of limbs off. It’s not afraid to get weirder, deeper, and darker, and it’s a brave take on this kind of a movie that we’ve seen many times before, but in this case, doesn’t feel like a drab. Not unlike the Belko Experiment, which was already way too depressing for its own good. It’s also nice to see Steven Yeun get a leading-role like this immediately after his stint on the Walking Dead. As a Korean-American actor working in Hollywood, it will be interesting to see where Yeun’s career goes; he fits perfectly both as a supporting-player, but also, as we see here, a rather rough and tough leading-man who has charm and bravado, sometimes in the same scene. There’s some depth to this character, but Yeun generally seems to be embrace this character’s more sinister-themes lying underneath everything else. Same goes for Samara Weaving who, from what I’ve seen so far, is becoming more and more of a powerful and likable presence on the screen. She’s absolutely beautiful, but she’s also the kind of beauty that isn’t afraid to dirty herself up, play around with her image, and get down in the mud, to roll around a bit. Here, she has to play something of a stickler that begins to lose her uptightness and just let loose, and it works – she’s lovely, charming, sweet, but also a little scary. In other words, a dangerous beauty. So look out, people. Consensus: While it is no doubt a nutty movie, Mayhem also brings in some social-context to go hand-in-hand with all of the violence and over-the-top features.